Last time we talked about the importance of choosing the correct “order of operations” in the synthesis of aromatic compounds [See post: Aromatic Synthesis (1): Order of Operations]. Alright. Now let’s throw a curveball. What Do We Do When Directing Groups Don’t Direct The “Right Way”? How would you synthesize this molecule, which has two ortho-, para- directors oriented meta– to each other? No two-step sequence of electrophilic aromatic substitution reactions will give you this product! Not to worry. 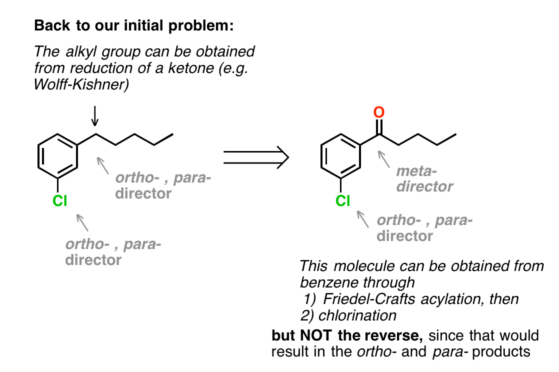 There’s a whole other bag of tricks we haven’t used yet – reactions that modify aromatic substituents – that will provide us with the solution to problems like this one. The key is to combine our knowledge of “order of operations” with reactions that change meta– directors to ortho-, para- directors (or vice versa). I like to think of this as a “polarity reversal” – changing the nature of the substituent from an electron-acceptor (meta- director) to an electron-donor (ortho-, para- director) or vice-versa. Having these reactions available to us greatly expands the number of products we can build from benzene. Let’s think backwards. 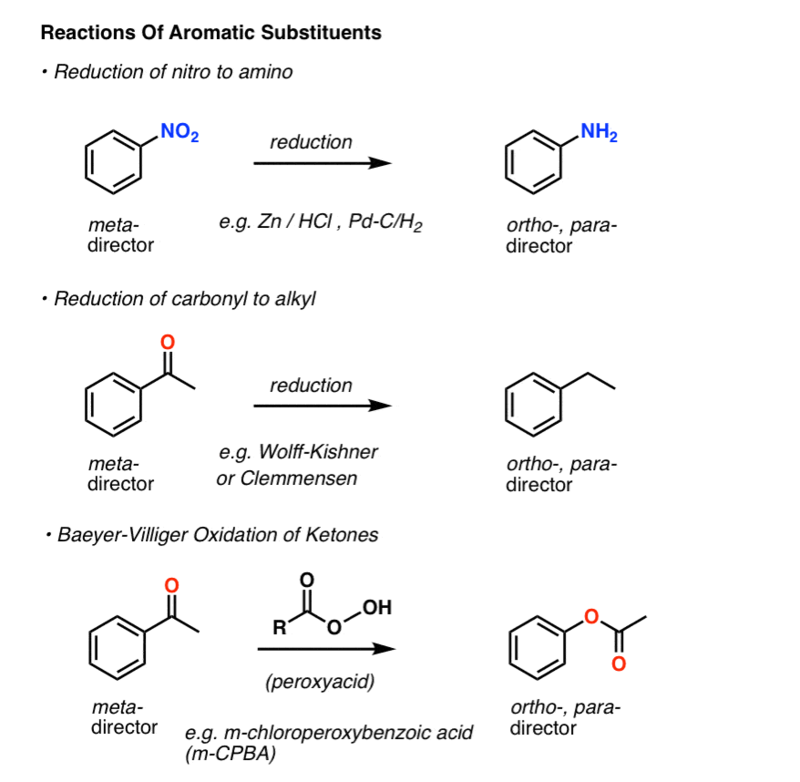 Having access to these reactions means that if there is an amine in a product we wish to make, it can be obtained from reduction of a nitro group. (The specific reactions to use in the forward direction are essentially equivalent, for our purposes). We can use a reducing metal like Zn, Fe, or Sn with acid, or catalytic hydrogenation over palladium or platinum. The nitro group, in turn, can be installed through electrophilic aromatic substitution (HNO3 + H2SO4). 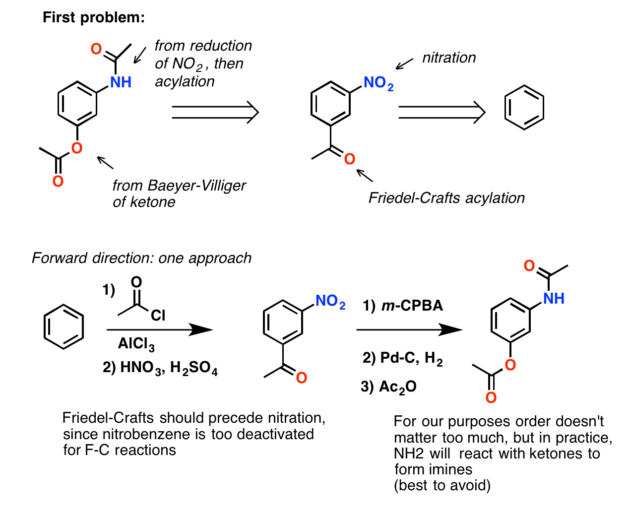 So any time you see an alkyl group in a target molecule, by all means consider the (straightforward) Friedel-Crafts alkylation, but also take a moment to think about how it could be installed through working backwards to a ketone. 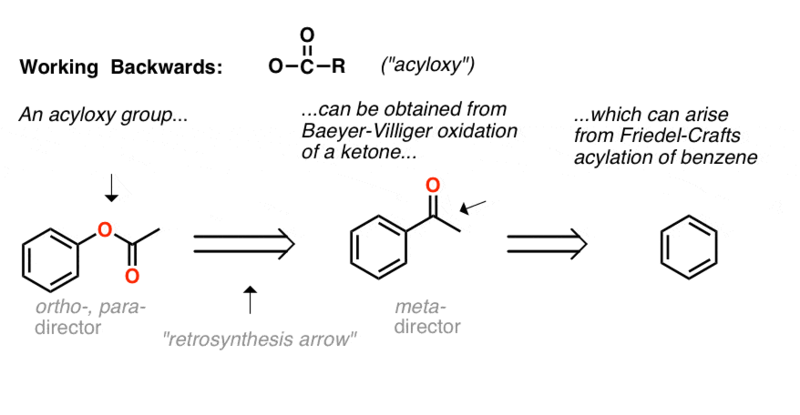 Finally, working backwards from an O-C(O)R group also gets us back to a ketone, via the Baeyer-Villger, and the ketone can be made through Friedel-Crafts acylation. Now, back to our regularly scheduled problem. Clearly we can’t build this molecule directly through two consecutive electrophilic aromatic substitution reactions. But what if we work backwards from the alkyl group to the ketone? That gives us a ketone – a meta- director. Now a solution becomes clear (as long as we get our order of operations correct)! 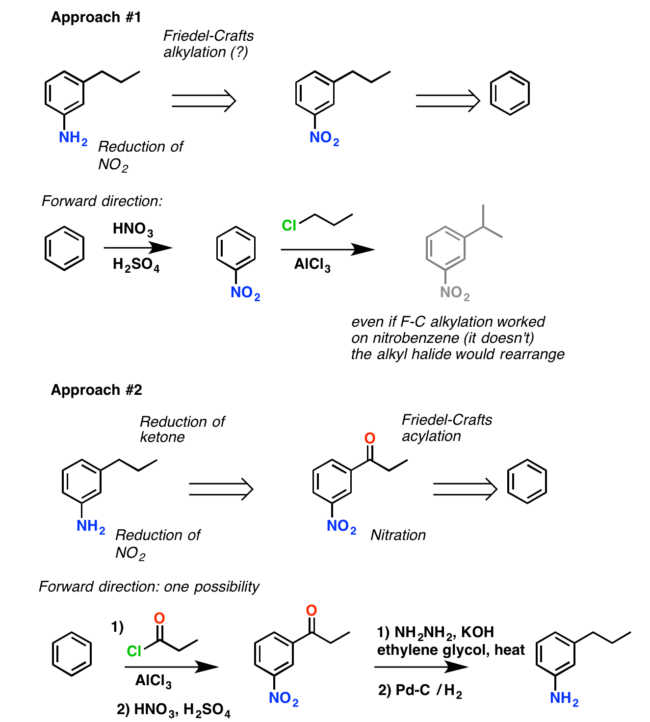 Since we want the meta– product, we start by installing the meta- director through a Friedel-Crafts acylation. We then chlorinate (Cl2 / FeCl3) and finally reduce the ketone to get our final product. (click here to see a pop-up image of one approach for performing this synthesis in the forward direction). Let’s look at a different type of problem. Below, we have a carboxylic acid (meta- director) para to a nitro group (another meta director). So how can we design a synthesis that gets these two meta- directors para– to each other? Working backwards from a carboxylic acid gives us an alkyl group, which could be obtained through Friedel-Crafts alkylation. Going back to our example, we see that working backwards from the carboxylic acid gives us an alkyl group (so long as it’s not t-butyl, the exact identity isn’t important, since KMnO4 chews up all alkyl groups with at least one benzylic C-H bond to give carboxylic acids). Synthesis of this para-disubstituted molecule requires that we start with the Friedel-Crafts alkylation, followed by nitration. 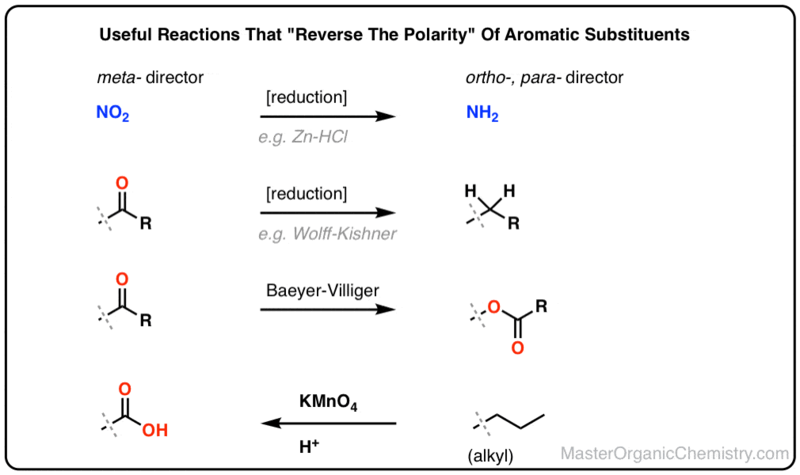 Planning the right “order of operations” with reactions that “reverse the polarity” of aromatic side chains will allow you to synthesize most of the molecules you will encounter in synthesis problems. (Additionally, we haven’t really considered nucleophilic substitution reactions here, but they could concievably be worked in too. In synthesis everything is fair game unless you’re told otherwise). Before we do a few practice problems, there’s one last trick to cover. What if you only want the ortho products and not the para? In the next post, we’ll show a strategy for doing this, using “blocking groups”. Benzylic bromination can be a useful precursor to meta- directors, although somewhat longer sequences of reactions are usually required to get to the desired product. Here’s an example. How do you synthesize this molecule with two meta- directors oriented para- to each other?? One way to do it would be to use a reaction that oxidizes an alkyl group to a ketone. One little problem: we haven’t learned how to do that directly. One way to get to the ketone from the alkyl bromide would be to perform an SN2 of the benzyl bromide with hydroxide (in a polar aprotic solvent) to give an alcohol, which could be oxidized to a ketone. Another way would be to eliminate the halide (E2) with strong base to give an alkene, followed by hydration (oxymercuration or H3O+) to give an alcohol, which could be oxidized similarly. The ketone is just one of other possible examples. 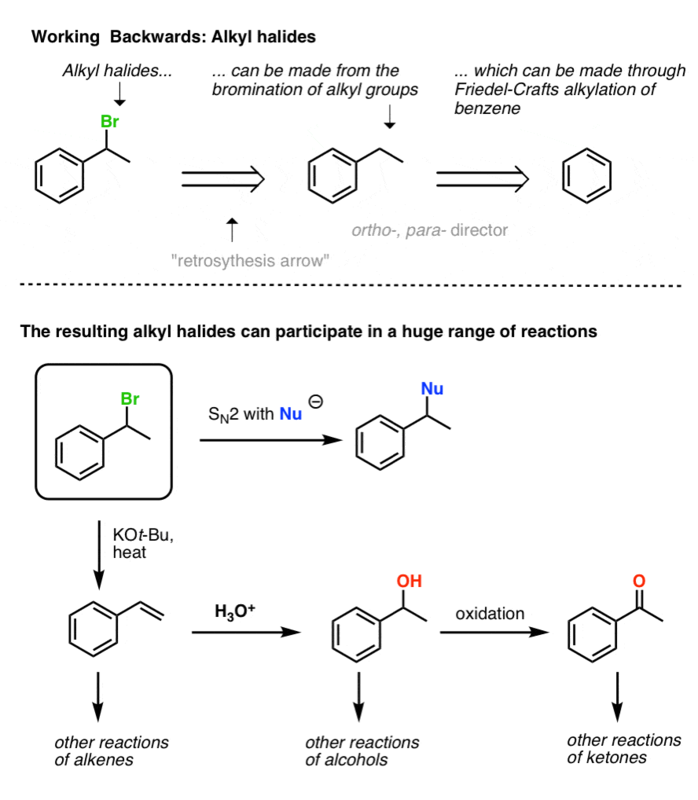 As the pathways below try to show, alkyl halides are a gateway not only to the many compounds possible from nucleophilic substitution reactions, but also to those arising from reactions of alkenes and alcohols. Note – For instance another way to do it (that doesn’t involve EAS) would be to make the carboxylic acid through reaction of a Grignard with CO2. The Grignard would come from Br or Cl, which are ortho-, para- directors. So: bromination, nitration, Grignard formation, then add CO2. 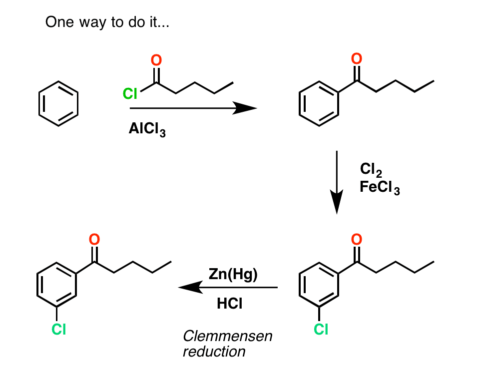 the clemmensen reduction to alkanes step at the link (click here to see a pop-up image of one approach for performing this synthesis in the forward direction). is incorrect!